VANFORD proprietary 3D premium tempered glass equipped with latest curved shaping and full adhesive technology will fulfill your Apple Watch the best protection ability against drops, bumps, scratches and other daily wear. Its excellent optical and touch performance make you feel like original watch. Easy installation completed in 7 minutes is big bonus to whom is not skillful on manual operation. .
DO NOT touch backside of the protector after back film is removed because adhesive layer is exposed. Symmetrically align the outline between Apple Watch and screen protector by visual, then place protector on surface of watch gently (Do Not push & squeeze at this step). Start to push & squeeze the protector surface from short side of one end to another end with some strength to drive the air out. In case there is air bubbles existing after the first installation you can lift up the glass edge of bubbles area gently then press & squeeze again with more strength to drive the air bubbles out. This is normal repeat operation for full adhesive protector. Every Vanford product includes a 45-day money back & 36-month replacement warranty. 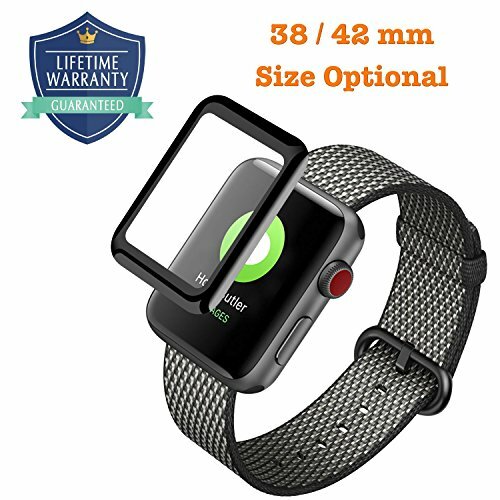 VANFORD proprietary design with adhesive on the entire screen of protector, not just on edges, makes it perfectly fit on curved screen of Apple Watch, no edge lifting, no bubbles, and no touch errors, maintaining high touch sensitivity for your device. The latest 3D tempered glass with 0.3mm ultra-thin thickness and curved edges provide you unparalleled smooth touch experiences on the whole screen, not just on the flat surface area. Specialized material and stack-up design make you complete installation in 7 minutes without annoying troubles and rework. 45-day money back & 36-month replacement warranty. If you have any questions about this product by Vanford, contact us by completing and submitting the form below. If you are looking for a specif part number, please include it with your message.